Simple & Clean codes for your programming needs!!! The Article Demonstrate the how to change the DataSource Property of DataGridView Dynamically. The method is so easy to handle. Here, I am taken an XML file as DataBase file. 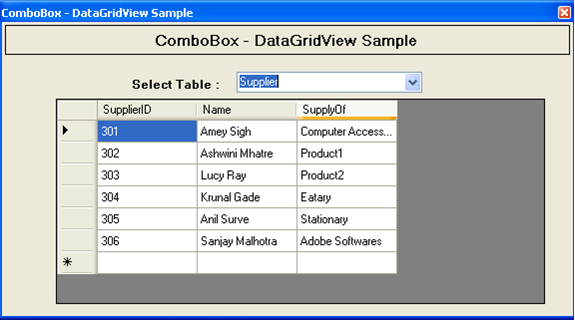 The Article shows displaying data into DataGridView Control of table name selected from the ComboBox Control. Create a new instance of the System.Data.DataSet class. Now, on the Form_Load event handler read an XML file using DataSet Object. Then add all the TableName avail in the DataSet Object to the ComboBox items collection. Result is displayed in Figure 1. After this, set the DataSource property of DataGridView to the selected item of ComboBox. Output: Following snapshots shows the intended result. In this session, we have seen the ComboBox – DataGridView operation for displaying table data dynamically from the selected item of ComboBox Control.